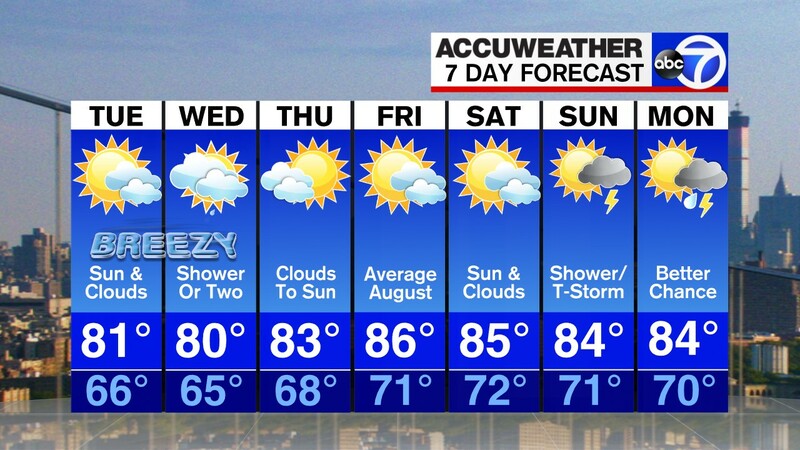 Meteorologist Jeff Smith has the latest AccuWeather forecast in the Tri-State area. NEW YORK (WABC) -- Wednesday will be another beautiful spring day with a cool breeze and comfortable temperatures. Another beauty with a cooler breeze and a high near 69. A bit cooler with a mix of sun and clouds with a high near 67. Showers and a thunderstorm with highs near 67. Sunny but gusty. High near 64. A few showers to the north with a high near 64. Mostly sunny with a high of 62. Chance of a shower with highs near 66.